Eric Von Schmidt was an American singer and guitarist, songwriter, painter and illustrator, and Grammy Award recipient. He was associated with the folk boom of the late 1950s and early 1960s and a key part of the Cambridge folk music scene. As a singer and guitarist, he was considered to be the leading Cambridge specialist in country blues at the time, thus the Cambridge analogue of Greenwich Village's Dave Van Ronk. Von Schmidt co-authored with Jim Rooney Baby, Let Me Follow You Down: The Illustrated Story of the Cambridge Folk Years. Von Schmidt's father, Harold von Schmidt, was a Western painter who did illustrations for the Saturday Evening Post. Von Schmidt began selling his own artwork while he was still a teenager. Following a stint in the army, he won a Fulbright scholarship to study art in Florence. He moved to Cambridge, Massachusetts, in 1957, where he painted and became part of the coffeehouse scene. Von Schmidt shared his large repertory of traditional music, passing them along to new performers who were developing a more modern version of folk music. He influenced Tom Rush, with whom he revived and arranged the traditional song "Wasn’t That a Mighty Storm?" about the 1900 hurricane that destroyed Galveston, Texas. When he met Bob Dylan, the two traded harmonica licks, drank red wine and played croquet. Dylan eagerly absorbed von Schmidt's voluminous knowledge of music, including folk, country and the blues. "I sang [Dylan] a bunch of songs, and, with that spongelike mind of his, he remembered almost all of them when he got back to New York," von Schmidt said in The Boston Globe. Von Schmidt is widely (and erroneously) credited as the author of the song, "Baby, Let Me Follow You Down", which was for years a staple of Dylan's musical catalogue. In a spoken introduction to the song on his 1962 self-titled debut album, Dylan jokingly mentioned that he first "heard" the song from "Rick von Schmidt" and told of meeting him "in the green pastures of Harvard University." In fact, von Schmidt had adapted the song from Blind Boy Fuller and credited Reverend Gary Davis as author of "three-quarters" of the song. His 1979 book about the Cambridge scene is titled after the song. Among his best known and performed original compositions is the song "Joshua Gone Barbados" which depicts Ebenezer Joshua the head of labor union and head of the government of Saint Vincent (island) vacationing during a time of labor strife leading indirectly to the deaths of three men. The accuracy of Von Schmidt's characterization of Joshua's involvement in the incident has been disputed. Given that Mr. Joshua died poor and remains a revered figure on the island, his depiction in the song is probably less sympathetic than it should be. Nonetheless, the song remains a powerful evocation of the plight of the poor people of Saint Vincent. In 1963, von Schmidt and Richard Fariña recorded in London's Dobell's Jazz Record store, with Dylan on harmonica. Two years later, The Folk Blues of Eric von Schmidt appeared atop a pile of records on the cover of Dylan's album Bringing It All Back Home. In May 1964, Dylan visited Von Schmidt at his home in Sarasota, Florida and recorded several songs there, including an early version of "Mr. Tambourine Man". The recordings were released in 2014 as part of Dylan's "50th Anniversary Collection 1964." Of course we had heard about Eric Von Schmidt for many years. The name itself had become a password. Eventually, after standing in line to meet him, there it was – his doorstep, a rainy day, and he greeted his visitors, inviting them in. He was told how much they liked Grizzly Bear [a von Schmidt song] and he then invited the whole bunch to the club, where he was about to perform the thing live. "C'mon down to the club" he said – "I'm about to perform it live." We accepted the invitation. And that is what his record is. An invitation. An invitation to the glad, mad, sad, biting, exciting, frightening, crabby, happy, enlightening, hugging, chugging world of Eric Von Schmidt. For here is a man who can sing the bird off the wire and the rubber off the tire. He can separate the men from the boys and the note from the noise. The bridle from the saddle and the cow from the cattle. He can play the tune of the moon. The why of the sky and the commotion from the ocean. Yes he can. Von Schmidt had a parallel career as a painter, and created album covers for Baez, Cisco Houston, John Renbourn, Reverend Gary Davis, Geoff and Maria Muldaur, the Blue Velvet Band, Jackie Washington Landron and for James Baldwin's readings. He also created the cover for The Blues Project compendium of white blues performers (Elektra EKL-264, 1964). Von Schmidt illustrated a 1973 book of twenty-five ghost stories called "The Haunting of America," by Jean Anderson. In the final 30 years of his life, Von Schmidt recorded only two records, and instead focused on his art career. Four years before his death, von Schmidt painted his last epic of American history. The canvas' subject was of Lewis and Clark's Corps of Discovery honoring its bicentennial. He also continued work on his "Giants of the Blues" series of paintings. Von Schmidt also illustrated numerous children's books including a number of collaborations with Sid Fleischman. Von Schmidt's music has been recorded by Travis MacRae and Jeff Buckley. In 2000, the same year he was diagnosed with throat cancer, he was honored with the ASCAP Foundation Lifetime Achievement Award at an event which featured a reunion of the Jim Kweskin Jug Band including Fritz Richmond. In 1997, he won a Grammy Award for his work on a compilation album entitled Anthology of American Folk Music, Vol. 1-3. He painted up until his death, and completed an epic mural of the Battle of the Alamo. Von Schmidt was twice divorced and had two daughters. He suffered a stroke in August 2006, and died six months later, at the age of 75. 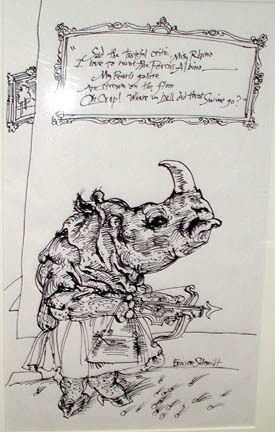 Von Schmidt, Eric, “Miss Rhino,” Westport Public Schools Digital Collections, accessed April 25, 2019, https://collections.westportps.org/items/show/1068.